This vanilla tart recipe is similar to a lemon tart but with the heady flavour of vanilla. The poached apricots add tang. For the tart pastry base, sift the flour and a pinch of salt into a mixing bowl and add the butter. Using your fingertips, rub in the butter until the mixture resembles breadcrumbs. Stir in the icing sugar, then gradually work in the egg yolk and 2-3 tbsp ice-cold water to make a soft dough. Wrap the pastry in cling film and chill for 30 min. On a lightly floured surface, roll out the pastry to a 30cm round and use to line a 25cm round x 2.5cm deep fluted tart tin. Prick the pastry base and chill for 20 min. Preheat the oven to 200ÁC/ fan180ÁC/gas 6. Line the pastry with baking paper and baking beans and blind-bake for 15 min. Remove the paper and beans and bake for a further 8-10 min, until the pastry is golden. Set aside to cool slightly. Lower the oven temperature to 150ÁC/fan130ÁC/gas 2. For the filling, pour the cream into a saucepan. Add the vanilla pod and bring slowly to the boil. Remove from the heat and leave to infuse until cool, then scrape the vanilla seeds from the pod into the cream and discard the vanilla pod. Beat the eggs, egg yolk, sugar and cooled cream together in a bowl, then pour into the pastry case. Bake in the oven for 30-35 min, until very softly set. Remove to cool completely äóñ the filling will continue to firm up as it cools. Meanwhile, make the poached apricots. Put the sugar, vanilla pod and seeds and 750ml water in a wide saucepan. Place over a low heat, stirring until the sugar has dissolved. Add the apricots and simmer for 5 min, until tender. Remove the apricots with a slotted spoon and set aside in a bowl. Return the pan to a medium heat and boil the syrup for 10 min, until reduced by half and thickened slightly. Pour over the apricots and set aside to cool completely. 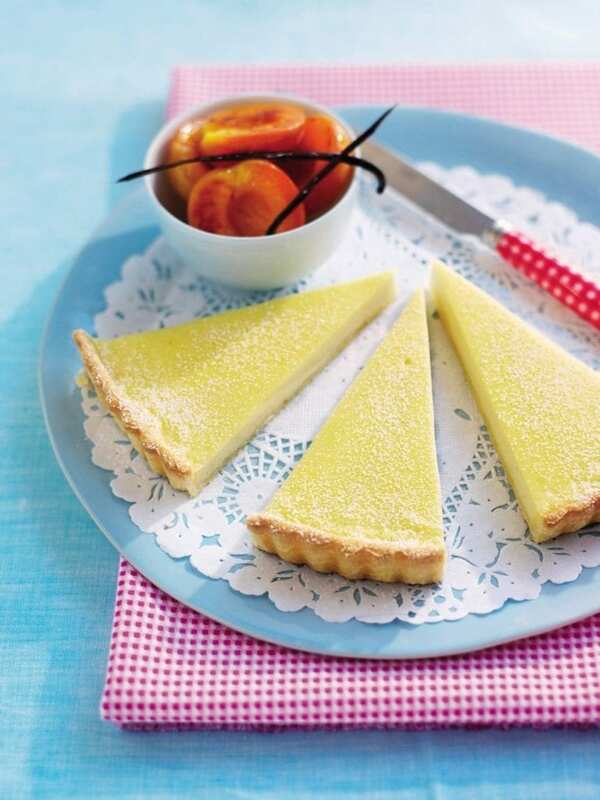 Dust the vanilla tart with icing sugar, slice into wedges and serve with the poached apricots.